Mike really loves Kimchi -- I can take it or leave it, often I choose to leave it. But I do love when Kimchi is used IN things and is served hot - such as kimchi fried rice, kimchi dumplings and kimchi stew (aka-Kimchi Jigae). We were recently gifted fresh and fermented kimchi...a lot of it. 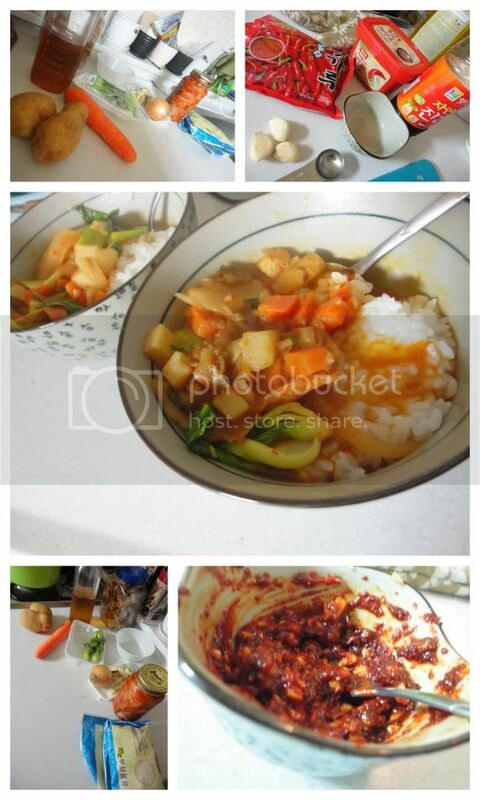 So, fully aware that we won't live in Korea forever, but I will miss certain foods, I set out to finding the perfect kimchi jigae recipe and I definitely found one - the secret is in the 'sauce' pictured bottom right hand corner. In a large stockpot or dutch oven heat some oil and saute an onion or half an onion depending on your taste preferences etc. Once the onions are translucent, shove them to the edge of the pot and dump in about a cup of chopped fermendted kimchi (more or less depending on your preferences again) and heat through. Now, at this point you can add meat (or you could do that first, honestly, we don't use a lot of meat so I don't know how that process should go) but we've added any of the following veggies: mushrooms, carrots, potatoes, bean sprouts, fresh cabbage and/or baby bok choy. With carrots and potatoes they'll need some time to boil in a bit of the broth or water so that they are edible, so if that's part of your veggie repertoire, they go in first. Mushrooms can be sauted with the onions if you disire, cabbage and bean spouts can go in after kimchi and﻿ I've always thrown the baby bok choy in for the last minute or so of cooking. Once you've figured out the order of veggies add broth or water, perhaps 4 cups, but once again it's completely your preference. Boil the stew for about 10 minutes or so while you prepare the special sauce. Sauce consists of Korean chili powder (I imagine most Asian markets would have this, or you could use an Asian chili powder as a substitute), Korean chili paste (go-juchang), Soy Sauce and Minced Garlic. I've done 2 tsp Powder, 1 tsp. Chili Paste, 2 tsp Soy Sauce and 2-3 cloves garlic...but it's spicy so think about who's eating the dish and move forward from that point. Stir in the sauce, throw in some tofu or baby bok choy if you wish. Serve alongside or over rice and enjoy a taste of Korea! I'm with Mike. Kimchi is soooo good. So far I've only had it plain and in Kimchi pancakes, but I've always wanted to have kimchi chigae.